Small SUVs are the hottest segment in the new car market right now. 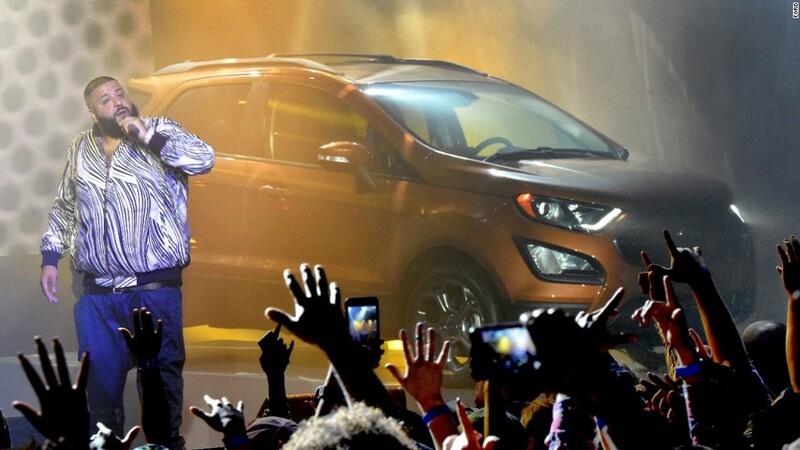 So maybe it shouldn't be surprising that a big chunk of the new vehicle unveilings at the Los Angeles Auto Show were little crossover SUVs. The Jeep Compass is another example of the car market's madness for small-sized SUVs. The current version is a strong seller despite abysmal reviews. Consumer Reports gave it the lowest rating of any compact SUV and Car & Driver awarded it a mere 1.5 out of a possible five stars. And yet, as of last month, Jeep Compass sales for the year were up 44%. According to Fiat Chrysler Automobiles (FCAM), which makes Jeeps, the sales jump reflects the Compass's relatively low price given all the desirable SUV features that it offers. It's too soon to know, of course, how good the new Compass is but it should at least be a vast improvement over the outgoing model. 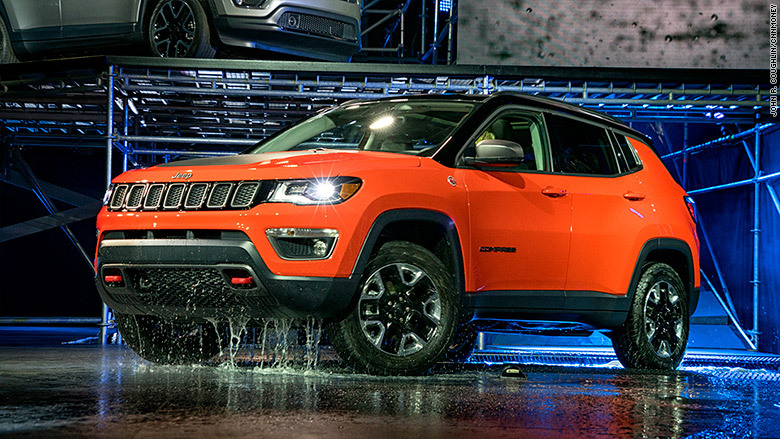 Since it's a Jeep, engineers took off-road capability seriously in creating the new Compass. Two different full-time all-wheel-drive systems are available including a super-slow off-road "crawl" gearing ratio. "Trail Rated" versions can wade through 19 inches of water and climb over steep hills and out of tight ditches. At the same time, Jeep also promises better on-road behavior. 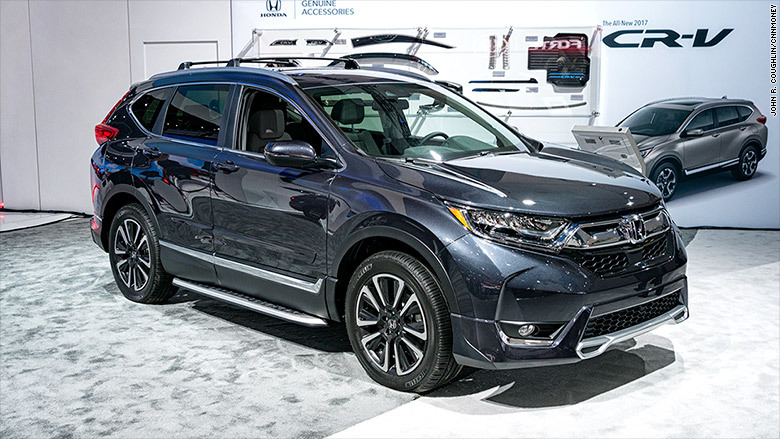 The new version will have the first turbocharged engine ever in a CR-V. Honda promises "more agile and confident handling" in the new version as well as a nicer and roomier interior. 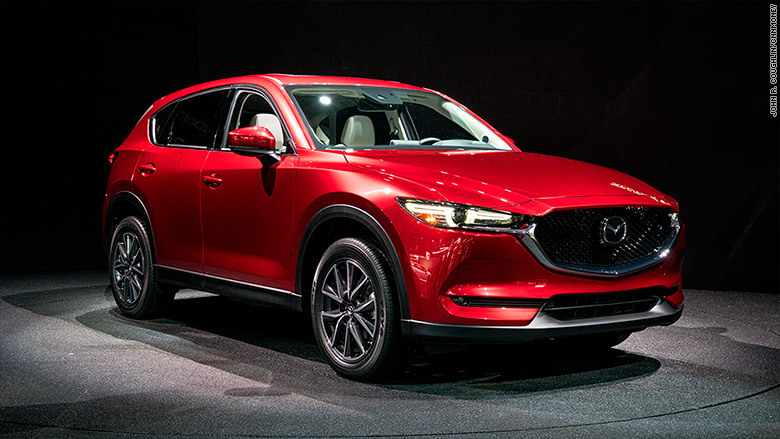 Mazda (MZDAF) rolled out a very sharp-looking redesign of its CX-5 crossover, a model that currently accounts for about a quarter of Mazda's sales in the U.S. With this new version, Mazda boasts of a better, more refined experience for passengers to complement Mazda's well-regarded driving experience. Toyota (TM) unveiled its new CH-R subcompact SUV. (The name stands for Coupe High Rider.) It's part of a relatively new species of super-small SUVs that, not too long ago, would have been unthinkable. The feeling once was that people bought SUVs for their capacious size. Clearly not so with crossovers like this. 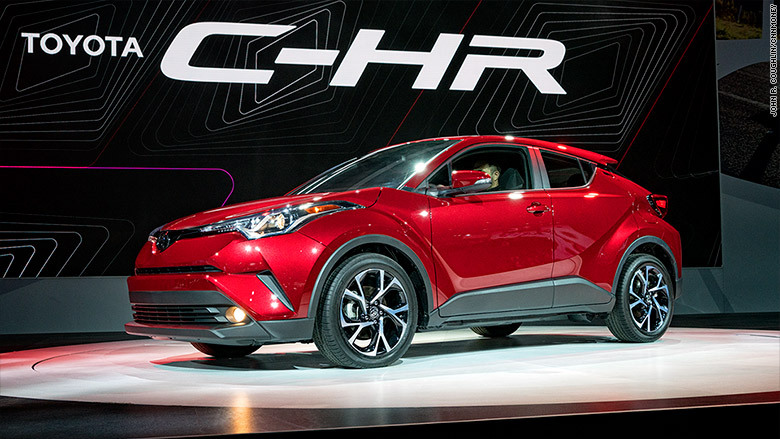 The CH-R is a very small low-backed crossover that, according to Bill Fay, head of the Toyota brand in the U.S., will still offer more interior space than competing subcompact SUVs in the market. And more competition is expected to come as more little SUVs are unveiled at future auto shows. Smaller SUVs weren't even the only SUVs unveiled at the L.A. Show. Volkswagen (VLKAF) showed off its new Atlas SUV which, as you can guess from the name, is not small at all. 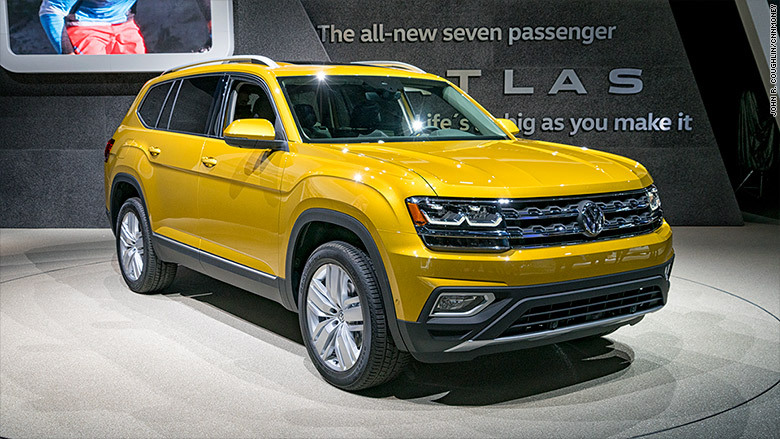 Built in Tennessee, the seven-seat Atlas will also be the biggest SUV VW sells here. Also, Alfa Romeo unveiled its new Stelvio SUV here. 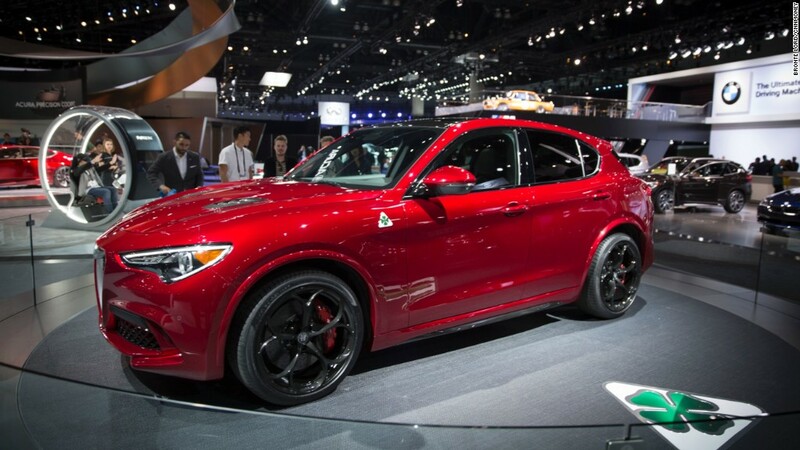 It's the first SUV ever offered by the Italian luxury brand. 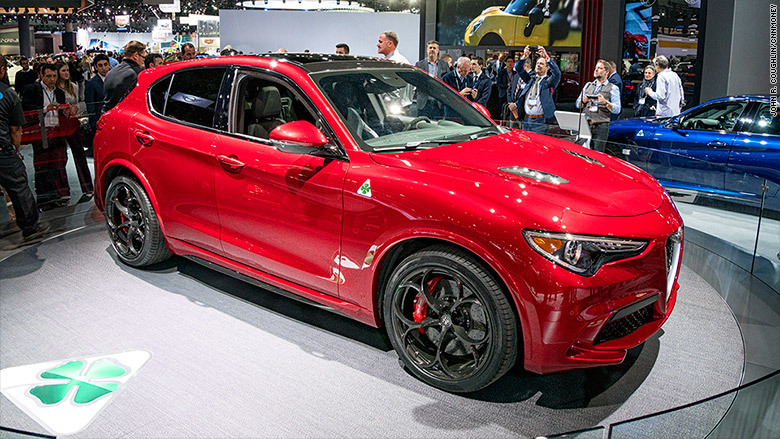 This new crossover will put the emphasis on sporty driving, especially in the performance-tuned Quadrifoglio version. That's powered by a 505-horsepower turbocharged V6 engine. (Less aggressive versions will have a 280 horsepower engine.) As you can probably tell by just looking at it, with its low ground clearance, this one is not intended for off-road use. It's expected to go on sale in the spring of next year.